Last weekend was a busy one and all events were fantastic, including the below photo with DJ Forrest at San Luis Resort, Galveston! This outdoor ceremony by the seawall was beautiful with a small setup with wireless, and DJ Forrest capped off his Saturday night on the 2nd floor Mainsail Salon ballroom with a DJ/Photobooth/Uplights/Gobo event at San Luis Resort. All the guests had an amazing time and complimented the music 🙂 Success!! From the official website of San Luis Resort..
We offer an array of picture-perfect venues with beautiful views of the Gulf that will enhance the beauty of your special event. We offer venues that work for many special occasions including the elegant Grand Ballroom, which accommodates up to 500 guests, and the Mainsail Salon for more intimate receptions. 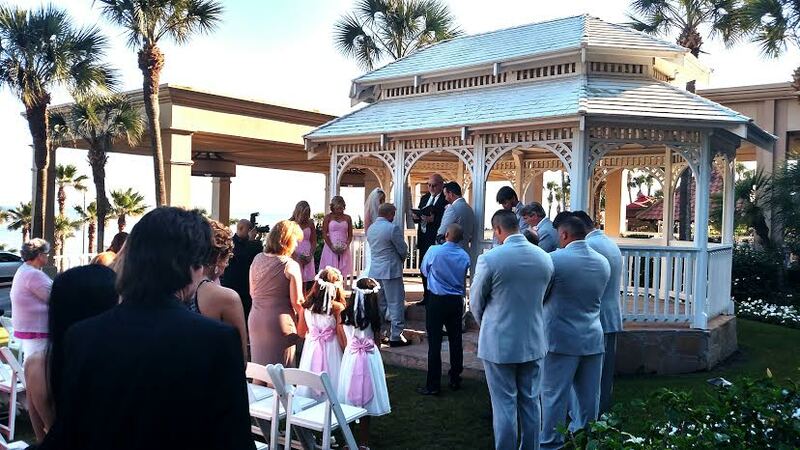 As part of our wedding reception packages, breathtaking fresh-air ceremonies are held in our Gulf-view Gazebo – a truly magical backdrop for your lifetime commitment. Our award-winning culinary team will work with you to customize a menu that reflects your taste and accommodates the needs of your guests. For your wedding day elegance, Spa San Luis provides professional make-up artistry and coiffures. Allow our management and associates to ensure flawless execution of service and personalized attention to detail for your Galveston beach wedding or other special occasion. At The San Luis Resort, no celebration is less than spectacular! Please contact us for more information about our picturesque Island reception location.